The sampling of aquatic macroinvertebrates provides a convenient and cost-efficient method for determining the water quality of a stream. Aquatic macroinvertebrates are water animals that have no backbone and can be seen without magnification. Aquatic macroinvertebrates include such animals as crayfish, clams, aquatic snails, aquatic worms, and the aquatic larvae of winged insects. Pollution Sensitive: This group of macroinvertebrates are very sensitive to water pollution. They are generally only found in water of good quality. 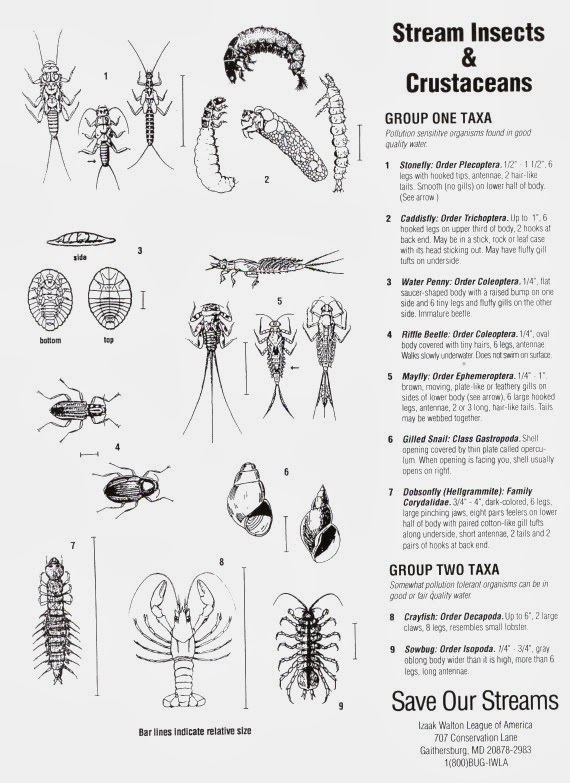 Somewhat Sensitive: This group of macroinvertebrates can tolerate low levels of water pollution. They can be found in water of good or fair quality. Pollution Tolerant: This group of macroinvertebrates are tolerant of pollution. They can be found in water of any quality.